Background: Osteoporosis is the most common metabolic bone disease. The purpose of this study is to investigate the health belief model (HBM) and social cognitive theory (SCT) for osteoporosis preventive nutritional behaviors in women. Materials and Methods: In this quasi-experimental study, 120 patients who were women and registered under the health centers in Fasa City, Fars Province, Iran were selected. A questionnaire consisting of HBM constructs and the constructs of self-regulation and social support from SCT was used to measure nutrition performance. Bone mineral density was recorded at the lumbar spine and femur. The intervention for the experimental group included 10 educational sessions of 55-60 min of speech, group discussion, questions and answers, as well as posters and educational pamphlets, film screenings, and PowerPoint displays. Data were analyzed using SPSS 19 via Chi-square test, independent t-test, and repeated measures analysis of variance (ANOVA) at a significance level of 0.05. Results: After intervention, the experimental group showed a significant increase in the HBM constructs, self-regulation, social support, and nutrition performance, compared to the control group. Six months after the intervention, the value of lumbar spine bone mineral density (BMD) T-score increased to 0.127 in the experimental group, while it reduced to −0.043 in the control group. The value of the hip BMD T-score increased to 0.125 in the intervention group, but it decreased to −0.028 in the control group. Conclusions: This study showed the effectiveness of HBM and constructs of self-regulation and social support on adoption of nutrition behaviors and increase in the bone density to prevent osteoporosis. Therefore, in order to investigate the factors affecting the adoption of osteoporosis preventive behaviors among women, it is essential to use models that identify the factors affecting behavior. Researchers have used such models to change their subjects' behavior. Two models effective in health education and promotion are the health belief model (HBM) and social cognitive theory. A common cause for resisting against preventive behaviors of osteoporosis is the false belief that the disease is not serious. According to HBM, people change their behavior when they understand that the disease is serious; otherwise they might not turn to healthy behaviors. The structures of the HBM model include perceived severity, perceived susceptibility, perceived benefits, perceived barriers, modifying variables, cues to action, and self-efficacy. In this study, perceived susceptibility was used to evaluate women's perception about the extent to which they are at risk of osteoporosis. Also, their perceived severity of osteoporosis complications was measured. The sum of these two factors is the women's perceived threat of the disease. 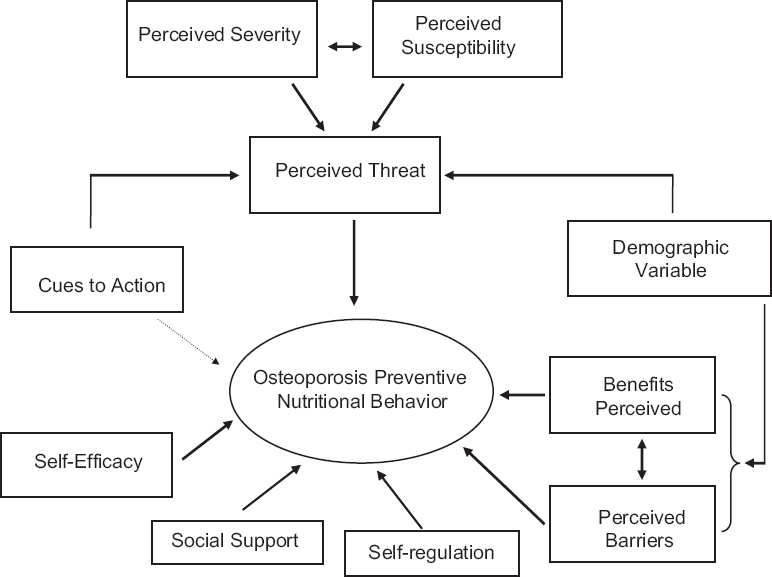 The perceived benefits and barriers that refer to the individual's analysis about the benefits of adopting preventive behaviors of osteoporosis, such as diet, and about the potential barriers to carry out preventive behaviors of osteoporosis were investigated. These, alongside women's perceived ability to carry out preventive behaviors, their cues to action (the incentives that affect women within and outside the family, such as friends, doctors, healthcare providers, media, and educational resources), their fear of osteoporosis complications and their sense of inner peace as a result of seeking preventive behaviors are the factors affecting women's decision to comply with the preventive behaviors of osteoporosis. Self-regulation includes behavior modification based on self-observations. Successful self-regulation is a consistent process of determining purposes, following them, achieving them, and determining new purposes. Considering what has been said above, this study aims to measure HBM constructs and constructs of social support and self-regulation taken from social cognitive theory regarding eating behaviors in the prevention of osteoporosis among women. Conceptual framework of this study is presented in [Figure 1]. The study is a quasi-experimental, prospective interventional research. The population of this study includes 120 women of age 30-50 years, covered by health centers of Fasa. Among the six urban health centers of Fasa City, Fars Province, Iran, two centers were randomly selected (a center for the experimental group and a center for the control group). Simple random sampling was used at the health centers, based on the numbers of health records of the mothers covered by the centers. The subjects were then invited to a meeting in a health center. They were explained about the study and the related purposes and their informed consents were obtained. Women with disability, diseases, and problems that prevented them from participating in the study were excluded. After selecting the experimental and control groups, the pre-test questionnaire was administered to the two groups. Next, to measure bone density, the subjects were sent to Fasa bone densitometry center. After testing, the results were recorded. Bone density was measured by Hologic machine using dual energy X-ray absorptiometry (DEXA) method in  L1-L4 bones. The densitometry data including bone density in lumbar spine and femoral bone was collected based on WHO's T-score values. Flow chart of the study participants is given in [Figure 2]. First session: Introduction to osteoporosis and its signs, complications, and diagnosis was given. Second session: A 55-year-old woman who was diagnosed with osteoporosis and had a fracture was invited to show as a model and talk to the subjects about osteoporosis, risk factors, symptoms, complications, and diagnosis with the help of an expert (physician). Third and fourth sessions: The role of nutrition in preventing osteoporosis, benefits and barriers of diet, following dietary recommendations, self-regulation, planning and goal setting, self-efficacy in observing proper diet, and their activities were recorded in the specified form. Fifth session: The session was held with the presence of at least one of the family members and the role of the family member in making, facilitating, and providing a suitable food program and in BMD testing was mentioned. Sixth session: Participants were divided into groups of five to six people each and the role of peers and friends in adopting osteoporosis-preventive behaviors was explained. The participants worked together to make a list of calcium-containing foods. Seventh session: Previous sessions were reviewed and the subjects were given pamphlets. Immediately after the intervention, both groups completed the questionnaire. To preserve and enhance the activity of the experimental group, weekly educational text messages about osteoporosis were sent to them and they attended monthly training sessions so that the researchers could follow-up their activities. Six months later, the questionnaire was completed by both groups (experimental and control), and the subjects underwent BMD tests and the results were recorded. The first part includes demographic questions, including age, body mass index (BMI), education level, marital status, occupation, times of delivery, breastfeeding, smoking, history of osteoporosis, history of osteoporosis in the family, history of a special disease, and history of bone densitometry. The second section includes questions on structures of the HBM and social support and self-regulation. The questions include: 23 questions on knowledge; 4 questions on perceived susceptibility (the women's opinion about chances of getting osteoporosis); 6 questions on perceived severity (about the complications due to osteoporosis); 8 questions on perceived benefits (about the benefits of preventive behaviors of osteoporosis, such as physical activity and calcium intake); 7 questions on perceived barriers (including the barriers to physical activity and consumption of calcium-rich foods); 4 questions on motivation (of the HBM) (such as motivation to receive health advice and conduct periodic examinations for prevention of osteoporosis); 4 questions on self-efficacy (including the ability to do exercises and observe proper diet); 1 question on external cues to action (resources including family and friends, doctors and health workers, mass media, books and magazines, internet, and other patients with osteoporosis that encourage the subjects toward preventive behaviors of osteoporosis); 3 questions on internal cues to action (including the fear of suffering from complications of osteoporosis and a sense of inner peace following preventive behaviors); 16 questions on self-regulation (including setting goals and planning preventive behaviors of osteoporosis); and 9 questions on social support (support from the family and friends to follow proper diet and carry out physical activity, bone density tests, etc.). Except for the questions on social support structures, all other questions are based on the standard 5-point Likert scale ranging from strongly disagree to strongly agree (scores of 1-5). Scores of questions on external cues to action are calculated as the cumulative frequency. Questions on social support are based on a four-point scale (very much, moderately, a little, and not at all) (scores of 1-4). The third section consists of questions on nutritional performance. Performance questions consist of 10 questions about the type and amount of food consumed during the past week (scores from 0 to 14). The subjects' performance was assessed via self-report method. To evaluate the validity of the questionnaire items, item effect size higher than 0.15 and content validity ratio above 0.79 were considered and based on the exploratory factor analysis, they were classified into nine factors. In order to determine face validity, a list of the items was checked by 30 women of age 30-50 years with demographic, economic, social, and other characteristics similar to those of the targeted population. In order to determine the content validity, 12 specialists and professionals (outside the team) in the field of health education and health promotion (n = 10), orthopedic (n = 1), and biostatistics (n = 1) were consulted. Then, based on the Lawshe's table, items with higher center validity ratio (CVR) value (more than 0.56 for 12 people) were considered acceptable and were retained for subsequent analysis. The calculated values in this study for the majority of items were higher than 0.70. The overall reliability of the instrument based on the Cronbach's alpha was 0.87. Cronbach's alpha was 0.86 for knowledge, 0.71 for perceived susceptibility, 0.82 for perceived severity, 0.79 for perceived benefits, 0.82 for perceived barriers, 0.77 for motivation, 0.79 for self-efficacy, 0.77 for cues to action, 0.73 for self-regulation, and 0.79 for social support. Since the alpha values calculated for each of the structures studied in this research were higher than 0.7, the reliability level of the instrument was considered acceptable. This study was approved by the ethics committee of Tarbiat Modares University. The aims and importance of the study were explained to the subjects and their written consent was obtained. The participants were assured that the information would remain confidential. Data analysis was carried out through SPSS 19 using Chi-square test, independent t-test, Mann-Whitney-Wilcoxon test, and repeated measurement analysis of variance (ANOVA) at a significance level of 0.05. Based on the results, the mean (SD) age of women who participated in the study was 41.75 ± (5.4) years for the experimental group and 41.77 (5.43) years for the control group. The mean (SD) BMI was 22.44 (3.30) for the experimental group and 22.27 (3.05) for the control group. The average number of deliveries for the experimental group was 2.57 (1.47) and for the control group was 2.50 (1.19). The above parameters did not show a significant difference between the two groups based on the independent t-test. [Table 1] shows the demographic data, including education level, marital status, occupation, breastfeeding, smoking, history of osteoporosis, history of osteoporosis in the family, history of special diseases, and records of bone densitometry. Based on the Chi-square test, no significant difference was found between the two groups in this regard. The results showed that before intervention, there was no significant difference between the two groups in terms of knowledge, perceived susceptibility, perceived severity, perceived benefits, perceived barriers, motivation, self-efficacy, internal cues to action, self-regulation, social support, and nutrition performance. However, immediately after the intervention and 6 months later, the experimental group showed a significant increase compared to the control group in all of the foregoing scales except for perceived barriers. 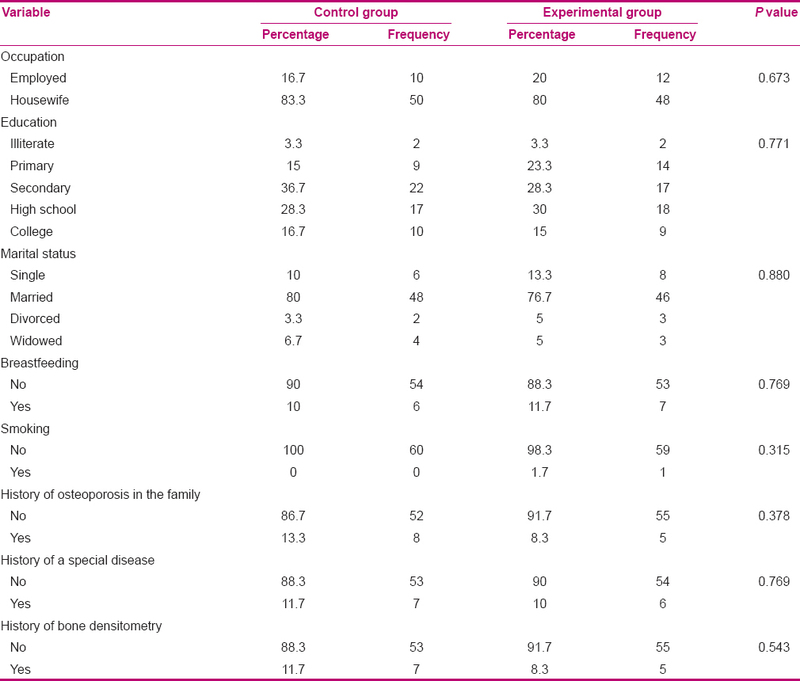 In structural barriers, the experimental group showed a significant decrease compared to the control group [Table 2] and [Table 3]. Comparison of BMD T-score in the lumbar spine and femur in women before and 6 months after intervention showed that before intervention, there was no significant difference between the experimental group and the control group in this regard. Six months after the intervention, the value of lumbar spine BMD T-score increased to 0.127 in the experimental group, while it reduced to −0.043 in the control group. The value of the hip BMD T-score increased to 0.125 in the intervention group, while it decreased to −0.028 in the control group [Table 4]. [Table 5] shows the distribution of external cues to action for osteoporosis, before, immediately after, and 6 months after the intervention. The number of cues used, especially family and friends, immediately after the intervention and 6 months after the intervention increased as compared to before intervention. This study showed that a key prevention method for osteoporosis is that of community-based intervention strategies using behavior change models such as the HBM and social cognitive theory. In this study, the participants' mean score of knowledge of osteoporosis before intervention was below average, which is consistent with the results of previous studies. ,,,, Results show that there were significant differences between the mean scores of knowledge before, immediately after, and 6 months after the intervention in the experimental group. The knowledge scores in this group increased significantly after intervention. This is consistent with the results of Ghaffari et al.,  Winzenberg et al.,  and Wafaa Hassan et al. Although the mean score of knowledge significantly increased in the control group as well, there was a significant difference between the mean scores of knowledge for the two groups. The increase in knowledge and other constructs can be due to the participants' access to information as well as their participation in the training course held by the Fasa health center about diseases and health issues for women and health volunteers. The increase in knowledge score in the intervention group was significant and deserves consideration. Before intervention, there was no significant difference between the two groups in terms of perceived severity. However, after intervention, the perceived severity of the experimental group significantly increased compared to the control group. This is consistent with the results of Khorsandi et al. and Hazavehei et al. However, the perceived severity in the studies of Tussing et al. and Sanaeinasab et al. showed no significant increase after intervention. The mean scores for perceived benefits showed greater increase in the experimental group than in the control group immediately after and 6 months after the intervention. Ebadi Fard Azar et al. showed that the construct of perceived benefits in the intervention group significantly increased after training, but this was not true for the control group. This is consistent with the findings of the present study. In the study by Mehrabbeik on the prevention of osteoporosis among women with low socioeconomic status, perceived benefits showed a significant increase after intervention. The increase in the perceived benefits can be the result of an emphasis on diet and the role of nutrition in preventing osteoporosis during training. Self-regulation refers to getting close to the states the individual has long been waiting for and getting away from those one has been afraid of. Leventhal et al. found that fear of communication increases problem-solving activities so that if the person understands the risk and has a plan of action to deal with it, he/she is likely to be able to take action to reduce the risk. Self-regulation is a technique that can help recognize barriers and deal with them. In this case, when the person observes that he/she is responsible for the change, he/she will gain motivation to continue the program. The mean score of social support showed a significant increase in the intervention group compared to the control group immediately after and 6 months after the intervention. Edmonds et al.,  Hsieh et al.,  and Ievers-Landis et al. stressed in their studies that osteoporosis prevention behaviors can be increased through increased social support. Springer et al. and King et al. also indicated that there is a relationship between physical activity and social support. In other words, the more the social support from family and friends, the better the subjects' exercise. In many other studies on different health behaviors, the role of external cues and supports was reported as positive. ,,, Reminders from other people, subjective norms, and significant others had positive impact on women's behaviors and encouraged them to carry out osteoporosis prevention behaviors. The results show the effectiveness of the intervention program and the importance of educational interventions to improve osteoporosis prevention behaviors. Results of the education based on the HBM, social support, and self-regulation showed that people with higher mean scores in these constructs performed better in activities for the prevention of osteoporosis and had better bone density. The limitations related to this research project include its sampling method. Convenience sampling is selecting the research participants on the basis of being accessible and convenient to the researcher. Another concern about such data centers is whether subjects are able to accurately recall past behaviors. Cognitive psychologists have warned that the human memory is fallible,  and thus, the reliability of self-reported data is tenuous on some items. Based on the results obtained from this study, it can be concluded that providing educational programs in this regard for family members, physicians, and other health personnel and offering training programs in radio and television broadcasting are essential. Further studies should use more comprehensive interventions on the structures of calcium intake benefits and barriers and use other behavioral change theories. It is advised that researchers explain social and behavioral barriers in calcium intake in different cultural contexts. The authors warmly appreciate the Deputy of Research of Tarbiat Modares University for their approval and financial support for the study which is extracted from a Ph.D. dissertation in the field of health education and health promotion, the respected women for their participation, and the staff of health centers in Fasa for their cooperation. Research number of project: 94089. Stubbs B. Osteoporosis and falls: Some further considerations for the nursing profession. Br J Nurs 2010;19:1431. Korpelainen R, Keinänen-Kiukaanniemi S, Nieminen P, Heikkinen J, Väänänen K, Korpelainen J. Long-term outcomes of exercise: Follow-up of a randomized trial in older women with osteopenia. Arch Intern Med 2010;170:1548-56. Mazor KM, Velten S, Andrade SE, Yood RA. Older women′s views about prescription osteoporosis medication: A cross-sectional, qualitative study. Drugs Aging 2010;27:999-1008. Berry SD, Misra D, Hannan MT, Kiel DP. Low acceptance of treatment in the elderly for the secondary prevention of osteoporotic fracture in the acute rehabilitation setting. Aging Clin Exp Res 2010;22:231-7. Anonymous Osteoporosis; Research Conducted at Veterans Affairs Medical Center has updated our Knowledge about Osteoporosis. Obesity, Fitness and Wellness Week. Vol. 20. Atlanta: Veterans Affairs Medical Center; 2010. p. 1087. Adachi JD, Adami S, Gehlbach S, Anderson FA Jr, Boonen S, Chapurlat RD, et al. ; GLOW Investigators. Impact of prevalent fractures on quality of life: Baseline results from the global longitudinal study of osteoporosis in women. Mayo Clin Proc 2010;85:806-13. Shirazi KK, Wallace LM, Niknami S, Hidarnia A, Torkaman G, Gilchrist M, et al. A home-based, transtheoretical change model designed strength training intervention to increase exercise to prevent osteoporosis in Iranian women aged 40-65 years: A randomized controlled trial. Health Educ Res 2007;22:305-17. Kathleen M, Stamp S, Bajan M, Dadkah M. Nutrition and diet therapy Krause′s food nutrition. Pub Nutrition World 2006;12:25. Prevention Disease Office. Ministry of Health and Medical Education. Guide to Diagnosis, Prevention and Treatment of Osteoporosis. Tehran: Pub Centered Prevention Disease; 2009. p. 35-67. Khorsandi M, Shamsi M, Jahani F. The effect of education based on health belief model on the improvement of osteoporosis preventive behaviors in pregnant mothers of Ark city. J Shahed Univ 2010;18:1-10. Pajouhi M, Komeylian Z, Sedaghat M, Baradar Jalili R, Soltani A, Larijani B. Efficacy of educational pamphlets for improvement of knowledge and practice in patients with osteoporosis. Payesh Health Monit 2004;3:67-74. Pour AA, Tohidi M, Dabbaghmanesh MH, Jafari P, Fattahi MR, Omrani GR. Prevalence of osteoporosis in rural men of Fars based on both local and WHO reference data. Iran J Endocrinol Metab 2010;12:393-400. Motlagh FN, Khani Jihoni A, Haider Nia A, Kave M, Hajizadeh E, Babaee Haider Abadi A, et al. Prevalence of osteoporosis and its related factors in women referred to Fasa′s Densitometry Center. J Ilam Univ Med Sci 2013;21:150-8. Kelley GA, Kelley KS. Exercise and bone mineral density at the femoral neck in postmenopausal women: A meta-analysis of controlled clinical trials with individual patient data. Am J Obstet Gynecol 2006;194:760-7. Madureira MM, Bonfá E, Takayama L, Pereira RM. A 12-month randomized controlled trial of balance training in elderly women with osteoporosis: Improvement of quality of life. Maturitas 2010;66:206-11. Baheiraei A, Ritchie JE, Eisman JA, Nguyen TV. Psychometric properties of the Persian version of the osteoporosis knowledge and health belief questionnaires. Maturitas 2005;50:134-9. Sedlak CA, Doheny MO, Estok PJ, Zeller RA. Tailored interventions to enhance osteoporosis prevention in women. Orthop Nurs 2005;24:270-8. Turner LW, Hunt SB, DiBrezzo R, Jones C. Design and implementation of an osteoporosis prevention program using the health belief model. Am J Health Stud 2004;19:115. Ryan P, Schlidt A, Ryan C.The impact of osteoporosis prevention programs on calcium intake: a systematic review.Osteoporos Int. 2013;24:1791-801. doi: 10.1007/s00198-012-2259-4. Epub 2013 Jan 12. Review. Sharma M, Romas I. Theoretical Foundations of Health Education and Health Promotion. Sudbury: Jones and Bartlet; 2010. p. 84-120. Ievers-Landis CE, Burant C, Drotar D, Morgan L, Trapl ES, Kwoh CK. Social support, knowledge, and self-efficacy as correlates of osteoporosis preventive behaviors among preadolescent females. J Pediatr Psychol 2003;28:335-45. Marmot M, Wilkinson RG. Social Determinants of Health. Translate by Montazeri A. Tehran: Jahad Daneshgahi; 2008. p. 193. Aarts H. Health and goal-directed behavior: The nonconscious regulation and motivation of goals and their pursuit. Health Psychol Rev 2007;1:53-82. Hofman W, Friese M, Wiers RW. Impulsive versus reflective influence on health behavior: A theatrical framework and empirical review. Health Psychol Rev 2008;2:111-37. Ito M, Harada A, Nakano T, Kuratsu S, Deguchi M, Sueyoshi Y, et al. Retrospective multicenter study of surgical treatments for osteoporotic vertebral fractures. J Orthop Sci 2010;15:289-93. Cadarette SM, Beaton DE, Hawker GA. Osteoporosis health belief scale: Minor changes were required after telephone administration among women. J Clin Epidemiol 2004;57:154-66. Burke-Doe A, Hudson A, Werth H, Riordan DG. Knowledge of osteoporosis risk factors and prevalence of risk factors for osteoporosis, falls, and fracture in functionally independent older adults. J Geriatr Phys Ther 2008;31:11-7. Anderson KD, Chad KE, Spink KS. Osteoporosis knowledge, beliefs, and practices among adolescent females. J Adolesc Health 2005;36:305-12. Gammage KL, Francoeur C, Mack DE, Klentrou P. Osteoporosis health beliefs and knowledge in college students: The role of dietary restraint. Eat Behav 2009;10:65-7. Ghaffari M, Tavassoli E, Esmaillzadeh A, Hasanzadeh A. The effect of education based on health belief model on the improvement of osteoporosis preventive nutritional behaviors of second grade middle school girls in Isfahan. J Health Syst Res 2011;6:714-23. Winzenberg TM, Oldenburg B, Frendin S, De Wit L, Jones G. Effects of bone density feedback and group education on osteoporosis knowledge and osteoporosis self-efficacy in premenopausal women: A randomized controlled trial. J Clin Densitom 2005;8:95-103. Al Seraty WH, Ali WG. The impacts of health belief model based intervention for osteoporosis prevention among female students in Al Dawadmi Applied Medical Science, Shaqraa University, Saudi Arabia. Journal of Biology, Agriculture and Healthcare 2014;4:125-31. Tussing Lisa, Chapman-Novakofski Karen. Osteoporosis prevention education: Behavior theories and calcium intake. J Am Diet Assoc 2005;105:92-7. Doheny MO, Sedlak CA, Hall RJ, Estok PJ. Structural model for osteoporosis preventing behavior in men. Am J Mens Health 2010;4:334-43. Nasab HS, Tavakoli R, Farrokhian A, Zarchi AA, Amini ZH. The effect of educational intervention with the health belief model on knowledge, perceptions and self-efficacy among adolescent of high school girls about osteoporosis, Tehran, Iran 2010-2011. The Journal of Urmia University of Medical Sciences 2013;24:163-9. Ebadi Fard Azar F, Solhi M, Zohoor AR, Hosseini AM. The effect of health belief model on promoting preventive behaviors of osteoporosis among rural women of Malayer. J Qazvin Univ Med Sci Health Serv 2012;16:58-64. Mehrabbeik A. The effect of education on knowledge, attitude and practice of women clients of Imam Khomeini Relief Foundation in one Isfahan province related to the preventive behavior of osteoporosis using the health belief model. Iran J Epidemiol 2010;7:30-7. Baumeister RF, Vohs KD. Self-regulation, ego depletion, and motivation. Social and Personality Psychology Compass 2007;1:115-28. McLeod KM, Johnson CS. A systematic review of osteoporosis health beliefs in adult men and women. J Osteoporos 2011;2011:197454. Bandura A. Health promotion by social cognitive means. Health Educ Behav 2004;31:143-64. Piaseu N, Belza B, Mitchell P. Testing the effectiveness of an osteoporosis educational program for nursing students in Thailand. Arthritis Rheum 2001;45:246-51. Jessup JV, Horne C, Vishen RK, Wheeler D. Effects of exercise on bone density, balance, and self-efficacy in older women. Biol Res Nurs 2003;4:171-80. Ryan P. Integrated theory of health behavior change: Background and intervention development. Clin Nurse Spec 2009;23:161-72. Besser SJ, Anderson JE, Weinman J. How do osteoporosis patients perceive their illness and treatment? Implications for clinical practice. Arch Osteoporos 2012;7:115-24. MiJeong P, Sue K, Eunhee C, Somi P, Hyuncheol K. A study on the development of a self-regulated exercise maintenance program for osteoporotic elderly women: Using intervention mapping protocol. J Korean Geriato Soc 2013;33:419-37. Wolfe ME. 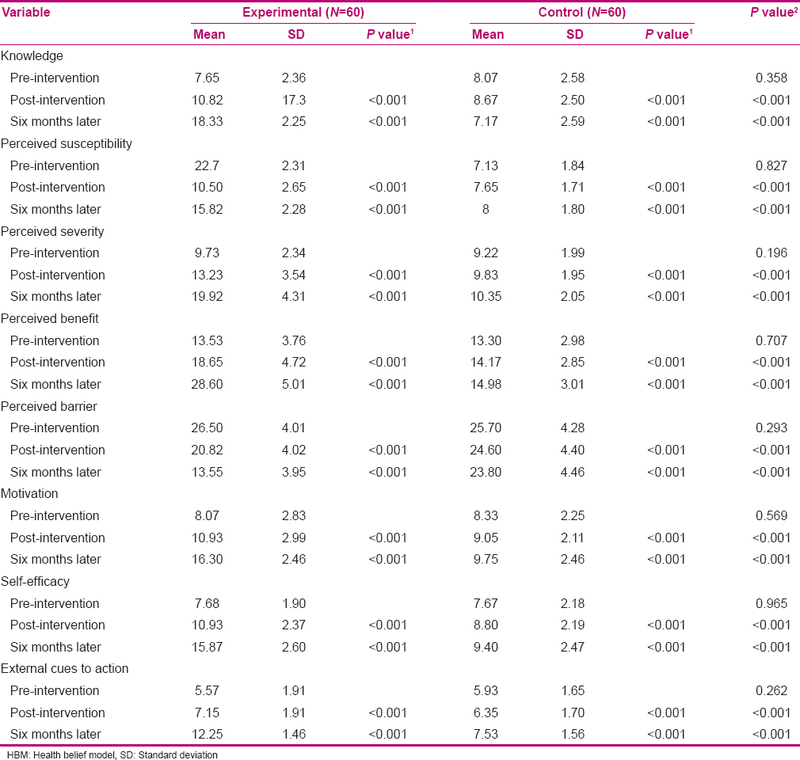 An Evaluation of an Exercise Adherence Intervention using the Social Cognitive Theory. Ohio: The Ohio State University; 2008. p. 11-60. Kelder SH, Perry CL, Klepp KI, Lytle LL, Longitudinal tracking of adolescent smoking, physical activity, and food choice behaviors. Am J Public Health 1994;84:1121-6. Edmonds E, Turner LW, Usdan SL. Osteoporosis knowledge, beliefs, and calcium intake of college students: Utilization of the health belief model. Open J Prev Med 2012;2:27-34. Hsieh CH, Wang CY, McCubbin M, Zhang S, Inouye J. Factors influencing osteoporosis preventive behaviours: Testing a path model. J Adv Nurs 2008;62:336-45. Springer AE, Kelder SH, Hoelscher DM. Social support, physical activity and sedentary behavior among 6 th -grade girls: A cross-sectional study. Int J Behav Nutr Phys Act 2006;3:8. King KA, Vidourek RA, English L, Merianos AL. Vigorous physical activity among college students: Using the health belief model to assess involvement and social support. Arch Exerc Health Dis 2014;4:267-79. Wen LK, Shepherd MD, Parchman ML. Family support, diet, and exercise among older Mexican Americans with type 2 diabetes. Diabetes Educ 2004;30:980-93. Aalto AM, Uutela A. Glycemic control, self-care behaviors, and psychosocial factors among insulin treated diabetics: A test of an extended health belief model. Int J Behav Med 1997;4:191-214. Albright TL, Parchman M, Burge SK; RRNeST Investigators. Predictors of self-care behavior in adults with type 2 diabetes: An RRNeST study. Fam Med 2001;33:354-60. Garay-Sevilla ME, Nava LE, Malacara JM, Huerta R, Díaz de León J, Mena A, et al. Adherence to treatment and social support in patients with non-insulin dependent diabetes mellitus. J Diabetes Complications 1995;9:81-6. Hazavehei SM, Taghdisi MH, Saidi M. Application of the health belief model for osteoporosis prevention among middle school girl students, Garmsar, Iran. Educ Health (Abingdon) 2007;20:23. Tarshizi L, Anousheh M, Ghofranipour FA, Ahmadi FA, Hoshyarrad A. The impact of education based on health belief model on the use of preventive factors of osteoporosis in postmenopausal women. Iran J Nurs 2009;22:71-82. Wallace LS. Osteoporosis prevention in college women: Application of the expanded health belief model. Am J Health Behav 2002;26:163-72. Shojaezadeh D, Sadeghi R, Tarrahi MJ, Asadi M, Lashgarara B. Application of health belief model in prevention of osteoporosis in vo-lunteers of Khorramabad City Health Centers, Iran. Health Serv Res 2012;8:183-92. Huang CM, Su CY, Chien LY, Gou JL. 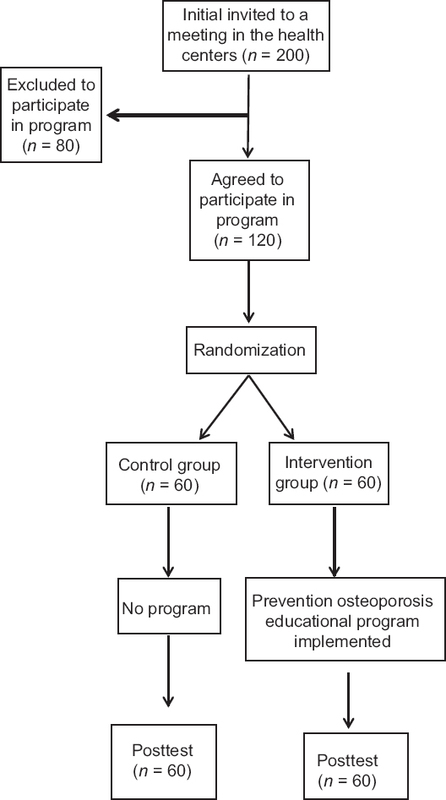 The effectiveness of an osteoporosis prevention program among women in Taiwan. Appl Nurs Res 2011;24:e29-37. Zhao JX, Zhang L, TianY. Effect of 6 months of Tai Chi Chuan and calcium supplementation on bone health in females aged 50-59 years. J Exerc Sci Fit 2007;5:88-94. Schacter DL. The seven sins of memory. Insights from psychology and cognitive neuroscience. Am Psychol 1999;54:182-203.